Jack Henderson Clement (April 5, 1931 – August 8, 2013) was an American singer, songwriter, and record and film producer. Raised and educated in Memphis, Clement was performing at an early age, playing guitar and Dobro. Before embarking on a career in music, he served in the United States Marines. In 1953, he made his first record for Sheraton Records in Boston, Massachusetts, but he did not immediately pursue a full-time career in music, instead choosing to study at Memphis State University from 1953 to 1955. 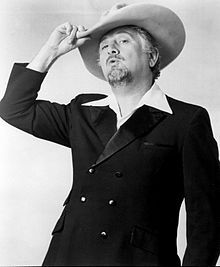 Nicknamed "Cowboy" Jack Clement, during his student days, he played steel guitar with a local band. In 1956, Clement was part of one of the seminal events in rock-and-roll history when he was hired as a producer and engineer for Sam Phillips at Sun Records. Subsequently, Clement worked with future stars such as Roy Orbison, Carl Perkins and Johnny Cash. Most notably, he discovered and recorded Jerry Lee Lewis while Phillips was away on a trip to Florida. One of those recordings, "Whole Lotta Shakin' Goin' On", was selected in 2005 for permanent preservation in the National Recording Registry at the Library of Congress. In 1957, Clement wrote the song "Ballad of a Teenage Queen", which became a crossover hit for Johnny Cash. Other Cash hits written by Clement include "Guess Things Happen That Way", which was No. 1 on the country chart and No. 11 on the pop chart in 1958, and the comedic "The One on the Right Is on the Left", which was a No. 2 country and No. 46 pop hit in 1966. Clement also produced Cash's No. 1 hit, "Ring of Fire," in 1963. Clement performed "Guess Things Happen That Way" on the "Johnny Cash Memorial Tribute" on CMT (Country Music Television) in November 2003. In 1958, Clement released the single "Ten Years", which was covered by Johnny Western (1959), Rex Allen (1962) and Roger Mews. In 1959, Clement accepted an offer to work as a producer at RCA Victor in Nashville, then the most important label in the record industry. In 1961, he moved to Beaumont, Texas, joining the producer and publisher Bill Hall in opening the Gulf Coast Recording Studio and the Hall-Clement publishing company. He returned to Nashville permanently in 1965, becoming a significant figure in the country music business, establishing a publishing business, and founding a recording studio, making records for stars such as Charley Pride and Ray Stevens. In 1971, he co-founded the J-M-I Record Company. Clement wrote a number of highly successful songs that have been recorded by singing stars such as Johnny Cash, Dolly Parton, Ray Charles, Carl Perkins, Bobby Bare, Elvis Presley, Jim Reeves, Jerry Lee Lewis, Cliff Richard ("It'll Be Me"), Charley Pride, Tom Jones, Dickey Lee and Hank Snow. He was inducted into the Nashville Songwriters Hall of Fame in 1973. He also produced albums by Townes Van Zandt and Waylon Jennings. Clement was involved in a few film projects as a singer or songwriter of soundtracks. He produced the 1975 horror film Dear Dead Delilah, the last film performance by the actress Agnes Moorehead. In 1987, Clement was approached by U2 to record at Sun Studio in Memphis. Clement was then oblivious to U2's catalog, but nonetheless agreed to arrange the session upon the urging of someone in his office. The result was a portion of the U2 album Rattle and Hum ("When Love Comes to Town", with BB King; "Angel of Harlem", a tribute to Billie Holiday; and "Love Rescue Me", with backing vocals by Bob Dylan), as well as the Woody Guthrie song "Jesus Christ", which was included on the 1988 album Folkways: A Vision Shared—A Tribute to Woody Guthrie & Leadbelly. Portions of the two sessions also appear in the film Rattle and Hum. In 2005, a documentary about Clement, Shakespeare Was a Big George Jones Fan, was created by Robert Gordon and Morgan Neville, pieced together from Clement's home videos and interviews with peers, including Jerry Lee Lewis and Bono. Clement hosted a weekly program on Sirius XM Satellite Radio. He was inducted into the Rockabilly Hall of Fame, the Memphis Music Hall of Fame, and the Music City Walk of Fame. On June 25, 2011, a fire destroyed his home and studio on Belmont Boulevard in Nashville. Clement was unhurt, but many priceless recordings and memorabilia were lost. On April 10, 2013, it was announced Clement would be inducted into the Country Music Hall of Fame. Clement died at his home in Nashville, Tennessee, on August 8, 2013. He had suffered from liver cancer. He had two children, a daughter, Alison, also a singer and writer, and a son, Niles, an engineer and photographer. ^ a b c d e "Country Hall of Fame Elects Kenny Rogers, Bobby Bare, Jack Clement". CMT News. cmt.com. April 10, 2013. Retrieved April 13, 2013. ^ Morris, Edward (August 8, 2013). "Cowboy Jack Clement, a Nashville Music Legend, Dies at Age 82". CMT. Retrieved August 9, 2013.